Black and white negative showing the Whitby Bruins Midget hockey team. The photograph was taken in front of Taylor's Arena. The boys are posing in uniform with equipment. The members of the team included: Bob Willis, Donald Stauffer, Aime Rousseau (manager), David Watts, Ben Lynde, Alex Brown, Eugene McLean, Ralph McCarl, Everett Quantrill, Isadore Parker and Joe Willis. Two unidentified boys are visible in the background looking through the windows inside of the arena. Taylor's arena was located on the block bound by Brock, Ontario, Green, and Gilbert Streets. It was built in 1913 form the remains of the Barnes arena built in 1889, and demolished in 1953. It was replaced by the Whitby Community Arena in 1954. 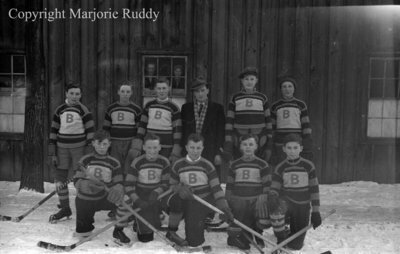 Whitby Bruins Midget Hockey Team, February 1938, Marjorie Ruddy. Whitby Archives A2013_040_947B.